Against a background of today's low risk culture, Richard Noble specialises in developing high risk ventures. Obviously not all of them can be successful, but the Thrust2 programme which brought the World Land Speed Record back to Britain in 1983 and the Thrust SSC first ever supersonic land speed record programme are the best known. 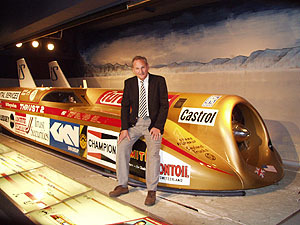 Richard Noble's other projects include the ARV Super2 light aircraft, the Atlantic Sprinter Blue Riband contender, Programme Funding, an original television funding company, Farnborough Aircraft, the first distributed travel air taxi aircraft and currently the Mach 1.4 Bloodhound SSC project the latest in the long line of Land Speed Record cars now being run through 3,600 UK schools. As an example The ThrustSSC team found itself head to head with both well funded American and Formula 1 teams. McLaren were building the Maverick supersonic car and had budgetted £25m. The Spirit of America team were reputed to have a $14m budget. The ThrustSSC team carried out the entire programme on a cash spend of £2.85m - 14% of the McLaren budget. The projects have always tended to be innovative - and that puts them against the odds and against the system which will always favour the conventional. Whilst support in terms of people and resource tends to be forthcoming, the financial support has always been the most difficult to achieve - whether sponsorship or investment - and often because of the financial community's real doubts about the teams ability to achieve. Oddly it does seem that the higher the perceived risk by the financial people, the greater the chance of the team achieving! As a conference and after-dinner speaker, Richard Noble illustrates the presentations with unique video and explains the huge problems in trying to persuade the old British establishment to consider and implement change and listen to original thinking - but despite the track record the British centralised funding machinery always seems to disappoint. So if the central funding machinery won't deliver then, thanks to the internet, it becomes possible to spread the risk and fund with a distributed funding system - which were key original features of SSC Programme Ltd. and Farnborough-Aircraft.com Ltd. But above all, these projects are difficult, and giving up is never an option. Richard can be contacted through his PA Tricia.